Wow. Talk about a ruckus in a rocks glass. 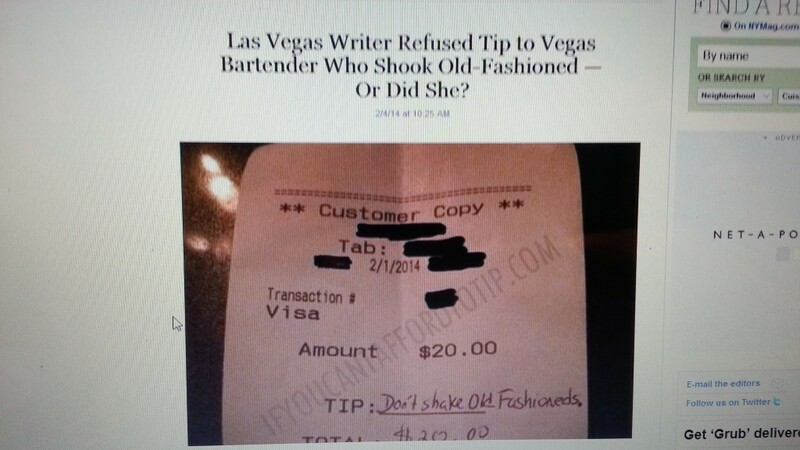 About three days ago, Xania Woodman, a Las Vegas-based cocktail journalist (who happens to be a friend and colleague) posted a pic on her facebook page of a bar receipt, the location and name blacked out, on which she wrote in the tip space "Don't shake Old Fashioneds, " indicating that she was leaving no gratuity. I saw the post when it was new, laughed for a second and considered commenting "Who pays $20 for an Old Fashioned anyway?" (I didn't) before moving on. Apparently others were not so nonplussed, in particular one anonymous soul who reposted the pic on the site IfYouCantAffordToTip.com, a blog which appears to exist mainly for F&B industry folks to complain about bad customers. Within hours, the page blew up with comments, many undoubtedly crossing the line and taking the incident as if it was an assault on all that is holy and sacred. It was claimed Woodman had to close her Twitter and Facebook accounts (not true at least for the latter: her Facebook is intact, although the post was removed) This morning, the kerfuffle made it as far as leading restaurant website Grub Street. What did we learn? Besides the proper way to make an Old Fashioned (which let's be honest, too few "bartenders" know), it seems we learned that there's an awful lot of resentment--and yes, sadly, misogyny--still lurking behind our bars. I've known Xania for over five years, and I can tell you a few things about her: 1) She attended the Hotel & Restaurant school at Cornell University, and originally landed in Vegas in a high-profile kitchen, so she is not just a dilletante. 2) She actually recently took a full bartending course at a local Vegas school just to understand the craft better, something very few spirits writers have done. 3) She is one of very very few writers in Las Vegas who takes cocktails seriously and knows what she's talking about--and who she's talking to. 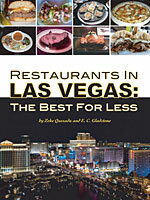 4) She is one of an even smaller group of F&B writers who is actually generally respected by the industry in Vegas. 5) Despite what one of many commenters said, I'm sure she can make a Sazerac. It's easy. 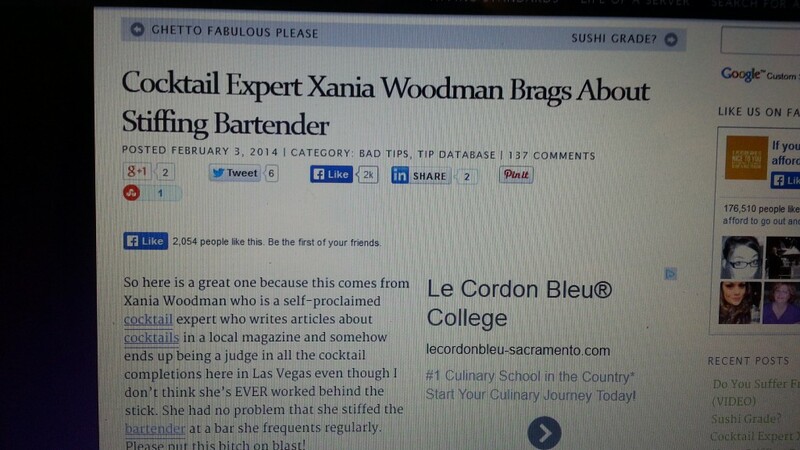 Did Xania really stiff a bartender who didn't know how to make one of the cocktail world's most basic recipes? Well, I cant say for sure without asking Xania herself--and I'm sure she will write her own thoughts about the matter when the smoke clears--but knowing her, and having seen how she typically handles herself at the bar, I doubt it. Stiffing a bartender over a crappy $20 drink sounds more like something I would do, actually (especially considering the tip alone would be more than the entire cost of the inflated drink). Okay, that's probably not true either. I would just kick myself for ordering an Old Fashioned from a f***tard. UPDATED: I JUST SPOKE WITH XANIA. AND WHILE MOST OF THE CONVERSATION WAS FASCINATING, IT WAS ALSO PRIVATE. HOWEVER, I CAN SAY THIS: YES, AS I PRESUMED, XANIA DID ACTUALLY LEAVE AN APPROPRIATE TIP. 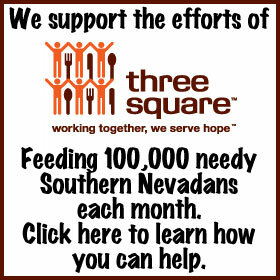 ABOUT OTHER ASPECTS, WE'LL HAVE TO WAIT FOR XANIA'S OWN RESPONSE, IN GOOD TIME. Do I believe the argument that Xania posted the receipt as a "social media experiment?" Not for a minute. I think it was a joke that got taken seriously. And a funny joke, too, by the way. If offended bartenders treated their craft as carefully as they treated their easily bruised egos, they would agree. While everyone should respect the fact that service people live off their gratuities, service people need to remember that those gratuities are still not an entitlement--they need to be earned. If that rankles you, then you are in the wrong business. Consider a service job where you get a better hourly wage--Starbucks is always hiring. As for the bartender who may or may not have been stiffed? I wouldn't worry too much about him (or her). With drink prices like that--especially in loose-spending Vegas--I'm sure he was over-compensated for the rest of his shift. Thanks to The Minty for links. Xania commented on her original (now hidden) Facebook post that she did leave a cash tip.